Captain Jack Sparrow is in search of the fountain of youth so that he may sail the seas as a pirate forever, but he is not the only one who is after the legendary spring of life. So too are Blackbeard, his daughter, the Spanish navy and Captain Barbossa. All in a race to the elusive fountain of youth, Jack Sparrow must outwit the opposing sides before they steal the thing he desires most. One thing you can associate with all the "Pirates of the Caribbean" films is bloated stories. Each of the previous movies have been bogged down by too many over-reaching story arcs and 'On Stranger Tides' doesn't change course from its predecessors. The film has too many distracting side plots that are unnecessary. It is a story that you wish someone would have came along and told screenwriters Ted Elliot and Terry Rossio, it is okay to edit, less is more. Instead they loaded up with new characters that are needless. The only real reason (most) of them are there is to provide further development in future prospective sequels. When last we saw Jack Sparrow, the crew of the Black Pearl along with Captain Barbossa had double-crossed Jack leaving him high and dry in Tortuga. Instead of picking up from this point, On Stranger Tides begins with a huge leap forward in time. Captain Barbossa is now missing half of his left leg and is working for the British navy. Something that will take Barbossa fans a minute to adjust to. 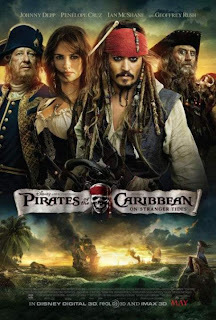 The crew of the Black Pearl has all but vanished and we are introduced to a whole new zombified crew working under the command of the infamous and magical Blackbeard. While I accepted the new characters, this leap feels unnecessary. The film could have very easily picked up right from where 'At World's End' left off. It doesn't and while we do see Jack Sparrow and Captain Barbossa battling to get to the fountain of youth we also get two or three other stories on top of it. 'Pirates 4' does steer in a new direction by finally allowing Jack Sparrow to be the main character. In all of the previous films Will Turner and Elisabeth Swann always felt like the focal point with Sparrow just there to mainly provide comic relief. While there is sure to be some loyalty to Turner and Swan's characters missing, I was glad to not have another film with their relationship propelling the story along. This time the film centers on Captain Jack Sparrow being caught in middle of a number of polarizing adversaries. Foes that Jack must stay ahead of and outsmart if he wants to achieve his goal. Much like before, Jack's uncanny ability to outwit his competitors comes at what seems to be simple dumb luck. A trait that has always made Captain Jack a likable figure and should once again bring a few smiles. His dumb luck will also raise a few eyebrows with the amount of "just go with it" plot holes that happen along the way but at least this time we have a film with Jack at the helm instead of hidden behind too many other characters. As for the new characters introduced in 'On Stranger Tides,' they are all a disappointment. Ian McShane is good in the role of Blackbeard but his character is irrelevant. We are introduced to one of the most fearless and vicious pirates in history yet he comes across as a softy. We also have Blackbeard's daughter Angelica Malon played by Penélope Cruz. The audience finds out very early on that Jack and Angelica have a rocky past and it is clear this will replace the love story lost with Will and Elisabeth no longer present. A relationship you can bet screenwriters Ted Elliot and Terry Rossio intend to develop over the course of not only this movie but its potential sequels. Their romance is a device and I am not so sure I really want to see it developed, especially when it deters the current film for the sake of a sequel. I'd like to talk about the concept of "for the sake of a sequel" for a moment. 'On Stranger Tides' is positioning itself for the next piece. It is not as blatant as 'Dead Man's Chest' is but too much of the story is only there for what will be developed in the future of this franchise. For instance, the mermaids. While the dark sequence of capturing the mermaids was really exciting, it was a useless plot device for further set up in a subsequent 'Pirates' movie and I don't really appreciate it. Disney is saying if you want to see this part of the story finished up, you'll have to come back for more. Sure movie making is a business and Disney wants to continue to build the franchise up and ensure we will come back for further installments, but when it is used as an excuse not to mention takes away from the film we are watching, I lose interest. By the by Disney has a tease at the end of the film post-credits as it has done for all of the previous films and that was enough, they did not need to add at least three other plot points that will not be concluded till one of the next films. "Pirates of the Caribbean: On Stranger Tides" was filmed in 3D and it shows. It is very obvious when watching a movie in 3D that was post-converted and those imperfections are thankfully absent here. Everything is seamless and there is no double figures depending on how you are looking at the screen. Truthfully I forgot I was watching a 3D movie which is how it should be. I don't think 3D should be used as a gimmick to have things pop-out in our faces (something 'On Stranger Tides' only did twice) instead it should be used to create true depth. Still, all that said, the 3D in 'On Stranger Tides' is a waste of time and money. Sure I enjoyed the depth it created and it was seamless, but it was also useless. It is not a movie I would recommend spending extra money on to see in 3D. Nothing will be lost by seeing it in traditional dimensions. I guess at the end of the day if the best examples of 3D still do not push me into believing 3D is necessary, then they haven't done their job. For now it remains just another added cost in going to the movies. One thing I really missed in 'On Stranger Tides' was the ships. In all of the previous 'Pirates' films we had substantial battles aboard the various ships, here nothing. There is no fighting between two opposing vessels. There is also very minimal swordplay. Where the last three films were heavy with warfare and swordplay, 'On Stranger Tides' is drastically absent of either. Instead we get a lot of chasing and getaways which are fun as well but do not fill the void of the missing battles. On its own 'On Stranger Tides' is a big mess. The story is clunky taking way too much time to get where its going and feels like it is missing some much needed action. As apart of the 'Pirates' franchise however, I think it is my favorite of the four behind 'The Curse of the Black Pearl." Both 'Dead Man's Chest' and 'At World's End' are so bogged down with content dependent on the other films they become a chore to follow along. Here the structure is straight forward and all laid out within the first thirty minutes even if it is clunky. Sadly none of the 'Pirates of the Caribbean' movies are very good and this one is just another cog in the wheel.